Nick is one of few clinicians in the country to be trained in both medicine and dentistry. He trained in dentistry at King’s College, London, graduating in 1999. He progressed immediately to a prestigious surgical training post at King’s College Hospital. He has worked and trained in Oral surgery for a total of 6 years. He was awarded membership to the Faculty of Dental Surgery of the Royal College of Surgeons of England in 2001. He then read medicine at Guy’s, King’s and St Thomas’ whilst simultaneously holding a teaching post in surgical dentistry for 4 years. He has trained in non-surgical facial aesthetic medicine and is able to provide the full range of treatments. He has trained in implant dentistry in the United States, including bone grafting and sinus lift procedures. Nick is a member of the Association of Dental Implantologists in the UK and regularly attends lectures and conferences on all aspects of implantology to maintain his knowledge in this field. 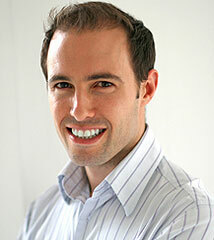 Nick’s special interest is the combination of aesthetic dentistry and dental implantology. He is a member of the General Dental Council, General Medical Council and the Association of Dental Implantologists.